Our Bomb Warrior deck list guide goes through the ins-and-outs of this popular Warrior build for the Rise of Shadows expansion! This guide will teach you how to mulligan, pilot, and substitute cards for this archetype! Bomb Warrior is an archetype introduced to Hearthstone in the Rise of Shadows expansion. There are multiple ways to build the deck, ranging from aggro to control, but the control variant is by far the most popular and will be the focus of this guide. It is a Control Warrior deck with a specific late-game win condition: shuffling bombs into the opponent’s deck that explode and deal 5 damage to the opponent’s hero when drawn, after which the opponent will get their regular card draw. 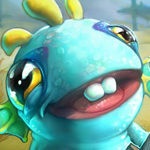 The ability to shuffle bombs has been around since The Boomsday Project, in which Seaforium Bomber was added to the game. It did not get any real attention, and deservedly so, because the effect was by no means extraordinary. Even doubling the shuffle with Augmented Elekk was worth hardly more than a yawn. However, Rise of Shadows introduced multiple new synergy cards for the archetype that not only make it viable, but actually make it a very strong top-tier deck. First of all, Clockwork Goblin and Wrenchcalibur make it possible to shuffle a lot more bombs into the opponent’s deck. If you wanted to go all-in on bombs and bounce effects, you could shuffle more than 20 bombs in a single game! You would probably not survive, but even if you don’t go all crazy, the threat from bombs is now on a completely different level than it used to be. Furthermore, there is Blastmaster Boom, an incredible payoff card for shuffling bombs. It is very similar to the old Dr. Boom, but instead of always summoning two Boom Bots, it can summon up to six of them, if your opponent has three bombs in their deck. As each Boom Bot explodes for 1-4 damage to a random enemy upon death, this is potentially game-winning on its own, even if the opponent does not draw any of the actual bombs in their deck! This constant threat is just one part of the deck. 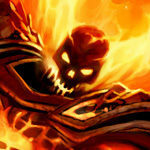 At its heart, Bomb Warrior – at least the build we are looking into in this guide – is a variant of Control Warrior. 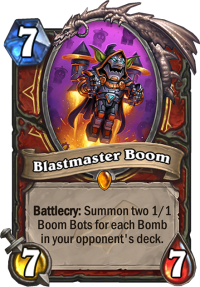 It defeats aggressive decks by neutralizing all of their threats: the bombs play but a minor role in those matchups, although a good Blastmaster Boom can swing them early. Against control decks, it is comfortable in taking the game long, all the way to fatigue, and in order to succeed, it needs to be strategic about its bomb use. Finally, it is a natural against combo decks, because combo decks want to draw cards, and Bomb Warrior can make drawing cards a scary prospect in a way Control Warrior has never been able to. 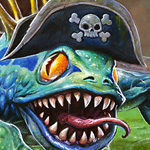 This sample deck list was piloted to #1 Legend by Posesi. 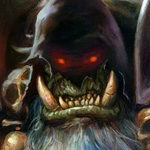 Check out alternative versions of this deck on our Bomb Warrior archetype page! Town Crier – Early minion that also tutors a useful card. Eternium Rover – Early minion to contest the board and gain armor. Militia Commander – Powerful removal minion for the early game. Warpath – Keep against token decks. Dyn-o-matic – Board clear on a stick. Only ineffective against Mech decks, where this should not be kept if you know what’s coming. Dr. Boom, Mad Genius – Your main value engine, allows you to maintain constant pressure and force the opponent to respond to your plays turn after turn. Wrenchcalibur – Good early bomb creator. Clockwork Goblin – Good early bomb creator. Blastmaster Boom – Can be kept together with some bomb creators. Clockwork Goblin – a bomb shuffler. Seaforium Bomber – a bomb shuffler. Wrenchcalibur – a bomb shuffler. Augmented Elekk – doubles your bomb generation. Dr. Boom, Mad Genius – can Discover more copies of Clockwork Goblin. Blastmaster Boom – major payoff card for having bombs in the opponent’s deck. Augmented Elekk + 2 x Clockwork Goblin = 4 bombs for 9 mana. Augmented Elekk + Clockwork Goblin + Wrenchcalibur = 4 bombs for 10 mana. In general, you want to shuffle some bombs early in order to power up your Blastmaster Boom, which creates a full board of Boom Bots when there are three bombs in the opponent’s deck. However, you also want to hold on to some bomb generators in slow matchups to shuffle large batches of bombs at once later in the game. When facing aggressive decks, your win condition is to remove all of their threats, the bombs hardly matter. Don’t focus on the bombs in these matchups, especially in the mulligan: you are looking for survival tools, early-game minions, and board clears. If you can find those tools, you can survive, and survival is all you need. Sure, there are some upsides to having bombs available. First, they power up your Blastmaster Boom, and Boom can help you swing the game earlier than would otherwise be possible. Second, they can be effective against aggressive decks that want to draw cards: Zoo Warlock, for example, loves to draw more cards and damage itself, and a few bombs in the deck can turn that into a dangerous affair. Many Rogue decks use Myra's Unstable Element, and bombs can make it a dangerous tool to use. You need to be strategic about Myra’s though: If you shuffle all of your bombs in too early and Rogue plays Myra’s with a full hand or almost full hand, all of those bombs may end up harmlessly burnt away. The fewer cards Rogue has in hand and in the deck, the better it is to shuffle more bombs in. Furthermore, you may be able to shuffle in bombs after Myra’s to make them explode instantly at the start of the Rogue’s next turn. However, for the most part, the aggro matchups are just pure control gameplay. You try to use the appropriate removal piece for each threat and have enough of them so that the opponent will run out of resources first. 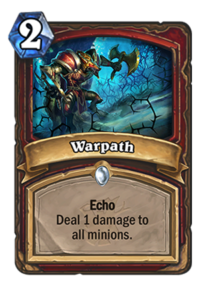 A common situation you may face in an aggro game is whether to use Warpath or Brawl to deal with a board: Warpath is generally better against small, wide boards, and especially against Deathrattle minions. Does the opponent have Deathrattle minions in their deck? Maybe a Soul of the Murloc or Soul of the Forest? Try to save Warpath for when it is needed. Brawl, on the other hand, is also good at dealing with wide boards, but it especially excels at dealing with wide boards that contain an individual big threat. Sea Giant on the board with a token army – that’s a Brawl party. Dyn-o-matic is one of your premium removal tools. Count how much non-Mech health there is on the board before committing it, and see if you can get that number to five or below. Remember that Dyn-o-matic does not hit Mech minions! 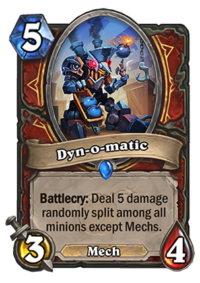 Dyn-o-matic is especially good if you have had time to switch over to Dr. Boom, Mad Genius, because then it will have Rush and it can hit something after the Battlecry effect. You are generally looking for opportunities to switch over to Dr. Boom, Mad Genius even against aggro decks, especially board-based ones. The enhanced Hero Power provides several ways to respond to minion threats, and is only weaker than your regular Hero Power against decks that run a lot of burn spells. 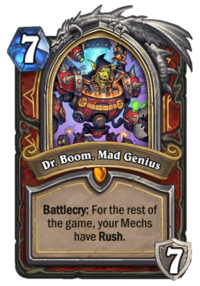 Dr. Boom, Mad Genius also provides you with a spike of seven armor, which can be important in enabling Shield Slam, which can otherwise be difficult to use at times in the post-Baku world. Shield Block provides a similar sudden boost of armor, and you often need to consider whether to use it early for card draw or save it for later to enable Shield Slam. When facing control decks, you want to be strategic about how you use your bombs. It is likely that both of you run Archivist Elysiana, and your control opponent may even be able to play the effect twice thanks to Youthful Brewmaster, Baleful Banker, or Shudderwock. 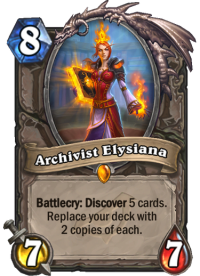 However, Archivist Elysiana costs eight mana, and for all other classes except Shaman it takes another two mana to shuffle a copy of it into the deck, so your opponent cannot do anything else on the turn they play Archivist Elysiana. Try to take advantage of this and create situations where playing the card is as awkward as possible. Augmented Elekk combos are important against control decks. If they ever reach fatigue, you can immediately hit them with four bombs for 20 damage. Do not commit all of your bomb generators too early, that will just enable them to go for Elysiana early. You need to keep bomb threats up and Blastmaster Boom ready to go while not committing too much. If your bomb plans fail, you are at a disadvantage, because much of your deck is dedicated to generating bombs, whereas their deck has more tools to remove threats. Even if you are on equal ground based on the discovered Archivist Elysiana cards, they are more effective at removing your threats than you are at removing theirs. Therefore, it is important to make sure that you benefit from the bombs and maintain the right level of pressure. Dr. Boom, Mad Genius is essential for maintaining pressure. 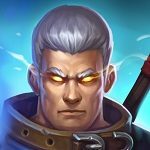 You want to switch to that hero as soon as possible in control matchups, because it generates tons of value and a constant stream of minions for you. In a game that lasts ten turns after you play your Boom, you can expect to get a boardful of 1/1 tokens and a couple of Discovered Mechs from the hero card alone. All varieties of Control Warrior are expensive to build, because there are several mandatory Epic and Legendary cards. Bomb Warrior is even more expensive than many other builds, because many of the bomb synergy cards themselves are also Epic or Legendary cards, on top of the already expensive Control Warrior card package. To make matters worse, many of the cards have no viable substitutes. Brawl and Dr. Boom, Mad Genius are core Warrior cards that cannot be replaced. Blastmaster Boom, Wrenchcalibur, Augmented Elekk, and Seaforium Bomber are part of the bomb package. It is possible to build a more midrange take of the archetype with just Blastmaster Boom and Wrenchcalibur, but this guide focuses on the more control-oriented variant that uses all of the synergy cards. Town Crier is a tutor for Rush minions in the deck. It is not absolutely mandatory, and it can be replaced with another draw effect, such as Slam. Zilliax is a great Mech minion that synergizes well with everything Warrior wants to do. There are no direct replacements, but it is not strictly mandatory. You can use the slot for another Rush minion or a tech card. Archivist Elysiana is a key card for control mirrors. It is not strictly mandatory, and you can use the slot for another Rush minion or tech card. 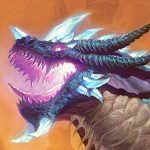 Ville "Old Guardian" Kilkku is a writer and video creator focused on analytic, educational Hearthstone, and building innovative Standard format decks. Check out Old Guardian on Twitter or on their Website! Great guide, as always! Thank you so much for your work. Bomb Warrior will be meta. Expect to see it in every Fireside Gatherings and in big tournaments like Hearthstone Championship Tour and World Cyber Games. This deck is the real bomb! I have had a hard time surviving with this deck… it has 0 hard removal, and the AOE package is not perfect, so a large minion or a bunch of mid size ones are kind of problematic. I feel this is not the definite list, maybe with more rush (as someone pointed below) it will be better. This list already runs a significant Rush package, I doubt more Rush is the answer. The deck obviously gives up some removal capabilities in order to include the bombs, but it still has plenty of removal tools on an average draw. It is possible to succeed without Archivist Elysiana, but it is a very strong card in Warrior mirrors, and Warrior is one of the most popular classes right now. what you personally thinking about the current power level of this deck? It is kinda slow imo. But when i first played and faced it, i really thought this will be nerfed. Now when Token Druid is making its great way back to the top, i dont think that blizzard considering patching the current meta. After Wild Growth and Nourish where stomped down, Druid now really deserves to be a great class played. Warrior had one of the best cards remaining after rotation with a great tempo and rush package. And i also think that now (my opinion change a bit the past days) also warrior deserves that place in the current meta. For now, the “current meta” feels really good. 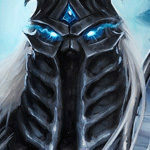 Nearly every Class has got a great deck to play in ladder and climb. They are not even in power levels, they all got their weaknesses. But i never expected this meta to be this interesting! And finally, the thing i like the most. Deathrattle Mech Hunter is playable! The Top 9 Decks for me (one for each class chosen) are: Midrange Mech Pally, Control/Dragon/Summon Mage, Token Druid, Control Warrior, Mech/Midrange Hunter, Murloc Shamy, Resurrect Priest, Magic Carpet Zoo Lock, Tempo Rogue. All these decks are competitive, playable ladderwise and so much fun! I expected this meta to be exciting. But iam really surprised how many cards from the past (like Shudderwock, Kangors Army, Janalai) are still/again playable! I also have to say, and i guess iam speaking for all of the dudes writing, commenting, discussing, posting and loving everything about Hearthstone here, that you guys doing an insane job with this site! This i think is in 100% in the top 3 most clicked sites when it comes to that game. You guys have a big place in my cookie list. Keep it up! We like it a lot! Bomb Warrior dominated the meta for the first couple of days, and the natural reaction to that is that people started to tech aggressively against it. 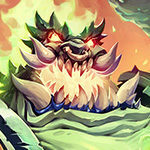 It is no longer dominant, but it is still strong, and it has some excellent tools to challenge the token decks too in Warpath and Brawl, so it is difficult to hate it completely out of the meta. By my experience, most of the mirror matches are decided with Elysiana: when it’s played and the cards it generates!